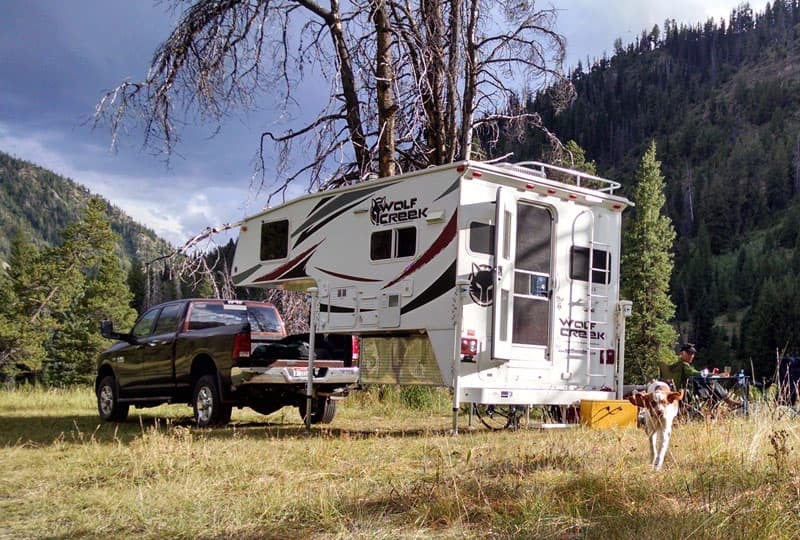 With a Wolf Creek 840, Leslie and Bob McMichael have assembled their ultimate go anytime rig for hunting, fishing, off-roading, running, and bicycling throughout the Northwest. Then Bob puts on a kilt and breaks out the bagpipes. The process of researching, selecting, and assembling the right truck and camper for you can be overwhelming. There are a ton of variables to nail down including truck preferences, camper layouts, truck and camper payload matching, your intended truck camping lifestyle, and possibly towing considerations. Fortunately, Truck Camper Magazine has a plethora of articles and web tools to help you with this process. The Newbie Corner, Buyers Guide, and Camper Chooser were all designed to get you to the right truck and camper for you as fast as possible. We essentially created what we wish had existed when we out our first truck camper rig together 13 years ago. Where was the Newbie Corner in 2004? The final result is incredibly worthwhile. As truck camper owners will tell you, having the right truck and camper rig assembled and ready to go at a moment’s notice is truly awesome. When opportunity knocks, you can pack, load, and roll. Some truck camper owners even keep their rigs packed and loaded all the time. When free time happens, they simply hop in the truck and go. Leslie and Bob McMichael have taken the spontaneous truck camping concept and ran with it – and biked with it, fished with it, and hunted with it. The go anytime versatility of truck camping has literally transformed Leslie and Bob’s free time allowing them to take their hobbies, interests, and even side-hustles to the next level. Did we mention Bob plays the bagpipes for weddings while using their truck camper? That’s right, their Wolf Creek doubles as a mobile Highland kilt dressing room. Leslie: We both grew up tent camping in the 1960s and 1970s. Bob was raised in Laguna Beach, California by his single mother, a public school art teacher and his stepdad, an electrical engineer. They took him and his younger brother for extended car camping trips throughout the United States during summer. I was raised in eastern Oregon. In the summer we loaded up the station wagon and camped in the national forests near our home. I did this maybe once or twice a summer with my parents and three siblings, plus all the stuff we needed; six heavy sleeping bags, a couple of canvas tents, coolers, food, stove, cooking gear, and clothes. I always remember how much work my mom had to do getting everything and everyone ready for one overnight weekend camping trip. It was just as much work unloading everything when we got home. Those experiences, even though it was great our parents exposed us to the mountains, actually turned me off to car camping for awhile because it seemed like too much work. When Bob and I met in our late thirties, we camped in the back of an old Toyota Four Runner with the seats folded down. Two years later we got married, sold the Toyota, bought a full-sized pickup, and slept in the back of our pick-up bed with a shell. It was spacious compared to the Toyota, but still not big enough for two people and a dog. We outgrew that set-up and bought a pop-up trailer to pull with our pickup. The pop-up trailer was okay, but we quickly learned that we didn’t like setting it up. If it was dark and raining, it was not much fun. Also, it wasn’t warm enough for the cold Idaho fall camping weather, even with the heater running. Then we bought a used VW EuroVan pop-up camper. It was great because it doubled as a vehicle to drive around town, and it was always ready for camping. My childhood experiences of hating to go car camping were now over. Except for perishable food, the van was always stocked with everything and ready to go at a moment’s notice. We did some amazing trips in the van but, after a couple of years, we realized our style of camping was increasingly off paved roads. The van didn’t have high enough clearance for where we wanted to go. Sadly, we sold the EuroVan because of the clearance issue. At that point we still had a full sized pick-up and we bought a travel trailer. The travel trailer was fine until we became boat owners and found out that we couldn’t go camping with our boat. We can tow both the trailer and the boat in Idaho, but double-towing is illegal in Oregon. So that, combined with our interest in off-road exploration, led us to truck campers. My brother-in-law had a pop-up truck camper. We slept in it once and liked it. From that experience, the mission was to find the perfect truck camper for us. TCM: Did you have specific criteria for the perfect truck camper?